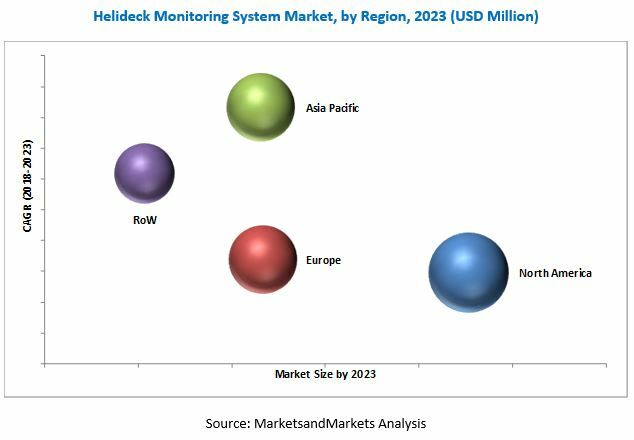 [119 Pages Report] The helideck monitoring system market was valued at USD 184.5 Million in 2017 and is projected to reach USD 240.1 Million by 2023, at a CAGR of 4.49 % during the forecast period. The base year considered for the study is 2017 and the forecast period is from 2018 to 2023. The helideck monitoring system ecosystem comprises helideck monitoring system providers, such as Kongsberg Gruppen (Norway), Fugro (Netherlands), and Vaisala (Finland), and the manufacturers of different types of helideck monitoring systems. The helideck monitoring system market is projected to grow from an estimated USD 192.8 Million in 2018 to USD 240.1 Million by 2023, at a CAGR of 4.49 % from 2018 to 2023. This growth can be attributed to the increasing number of commercial vessels and ships globally. The growth in global vessel traffic and short replacement cycles of hardware components are the key factor driving the demand for helideck monitoring systems. Based on vertical, the helideck monitoring system market has been segmented into oil & gas and marine. The marine segment is expected to lead the helideck monitoring system market during the forecast period due to increasing maritime vessel traffic and increasing trade via sea routes. Based on system, the helideck monitoring system market has been segmented into hardware and software. The hardware segment is projected to grow at a higher CAGR than the software segment during the forecast period. The early replacement of hardware components, such as motion sensors, is a key factor driving the demand for helideck monitoring systems. Based on application, the helideck monitoring system market has been segmented into commercial and defense. The commercial segment is projected to grow at a higher CAGR than the defense segment during the forecast period. The rise in vessel traffic, especially in regions such as North America and Asia Pacific, has led to an increase in demand for helideck monitoring systems in the commercial segment. Based on end use, the helideck monitoring system market has been segmented into OEM and aftermarket. The aftermarket segment is projected to grow at a higher CAGR during the forecast period. The rise in vessel traffic, especially in regions such as North America and Asia Pacific, and the short replacement cycle of components, such as motion sensors, have led to an increase in demand for helideck monitoring systems in the end use segment. 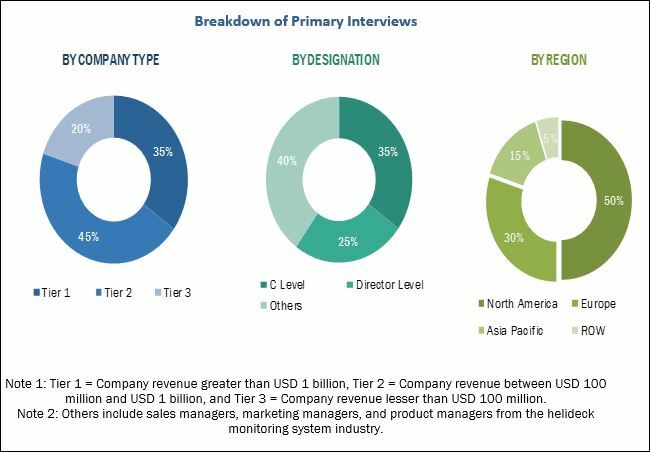 The geographical analysis of the helideck monitoring system market includes regions such as North America, Europe, Asia Pacific, and Rest of the World (RoW). The Asia Pacific region accounted for the largest share of the helideck monitoring system market in 2017 Several countries, such as Brazil, Argentina, Saudi Arabia, and the UAE, are increasing their defense and commercial marine fleets. However, the Asia Pacific helideck monitoring system market is projected to grow at the highest CAGR during the forecast period due to the increase in vessel passenger traffic and military vessel induction in countries such as India, China, and Russia. Existing backlogs of vessel deliveries act as a restraint to the growth of the helideck monitoring system market. The limited manufacturing capacity of major marine vessel manufacturing companies has resulted in an increased backlog of commercial vessel deliveries. Products offered by various companies in the helideck monitoring system market have been listed in the report. The recent developments section of the report includes recent and important developments by various companies between 2014 and 2017. Major companies profiled in the report include Kongsberg Gruppen (Norway), Fugro (Netherlands), and Vaisala (Finland), among others. Agreements and acquisitions accounted for the major share of the total growth strategies adopted by the leading players in the helideck monitoring system market. These strategies have enabled companies to strengthen their position in the helideck monitoring system market.